Every morning, Melanie waits in her cell to be collected for class. When they come for her, Sergeant Parks keeps his gun pointing at her while two of his people strap her into the wheelchair. She thinks they don't like her. She jokes that she won't bite. But they don't laugh. M. R. Carey has been making up stories for most of his life. 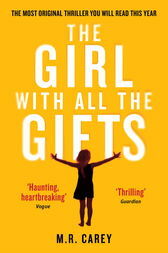 His novel The Girl With All the Gifts has sold over a million copies and became a major motion picture, based on his own BAFTA Award-nominate screenplay. Under the name Mike Carey he has written for both DC and Marvel, including critically acclaimed runs on Lucifer, Hellblazer and X-Men. His creator-owned books regularly appear in the New York Times bestseller list. He also has several previous novels including the Felix Castor series (written as Mike Carey), two radio plays and a number of TV and movie screenplays to his credit.